A more recent visit to Europe on a ‘Mother/Daughter’ trip and the place we probably went through every day. The Plaça de Catalunya, a large plaza surrounded by monumental buildings, is Barcelona’s busiest square. 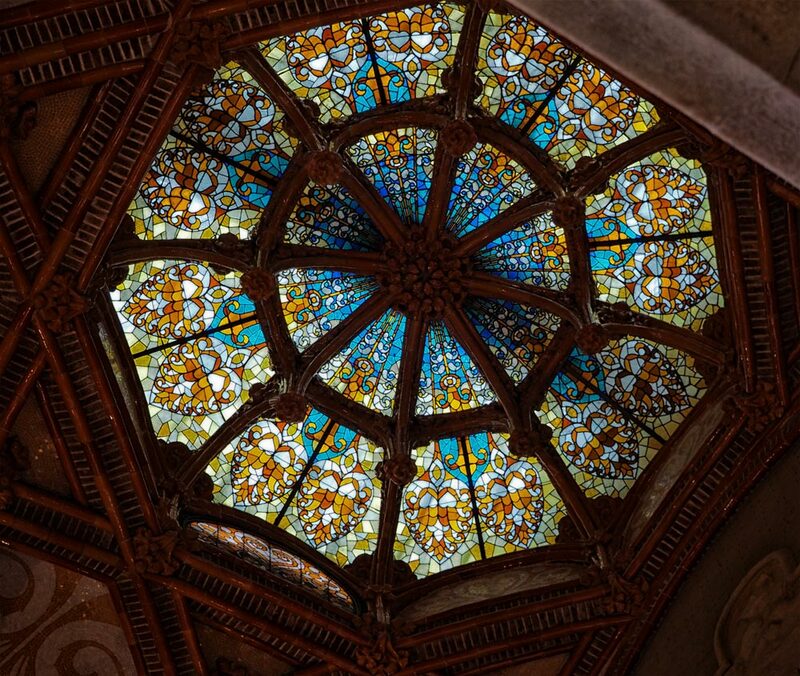 It is located between the old city (Ciutat Vella) and the nineteenth century Eixample district. 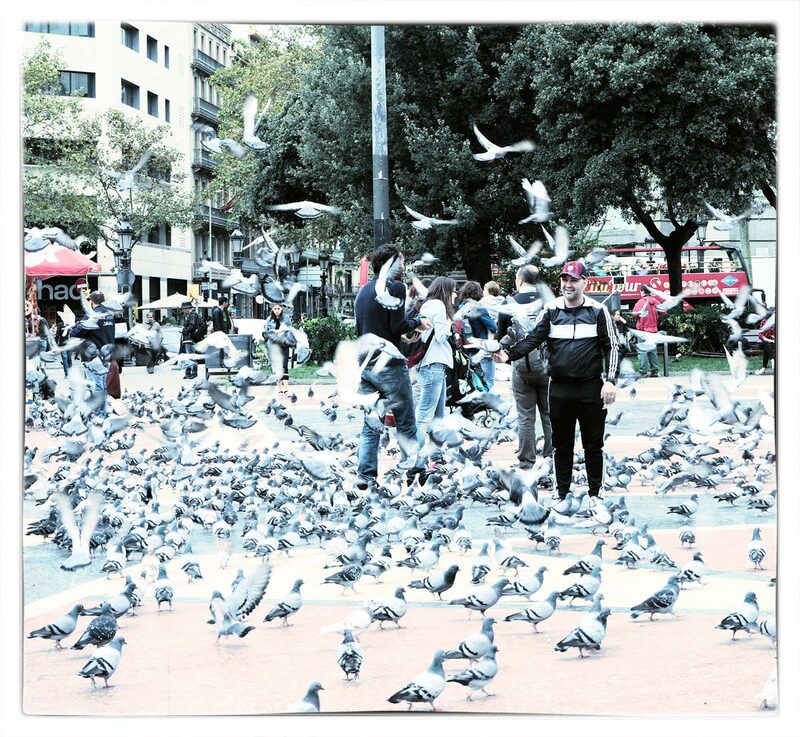 And has lots of pigeons! 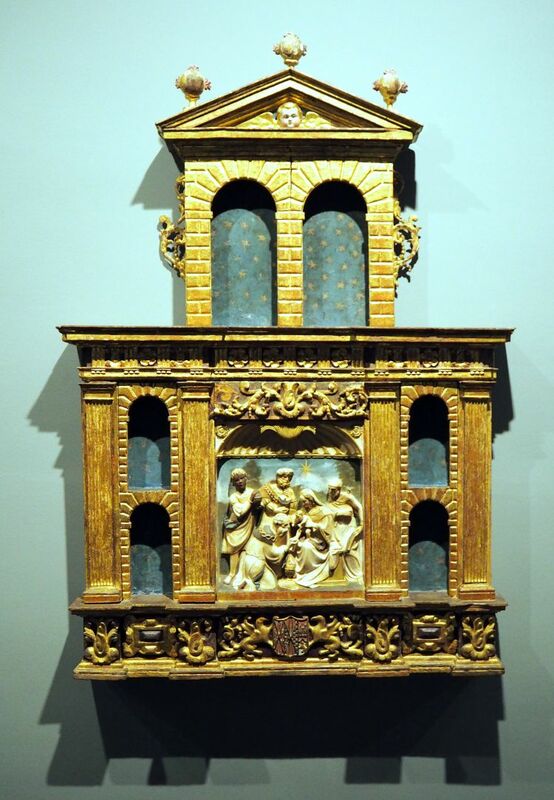 The Monastery Treasures: Monastery of Pedralbes. 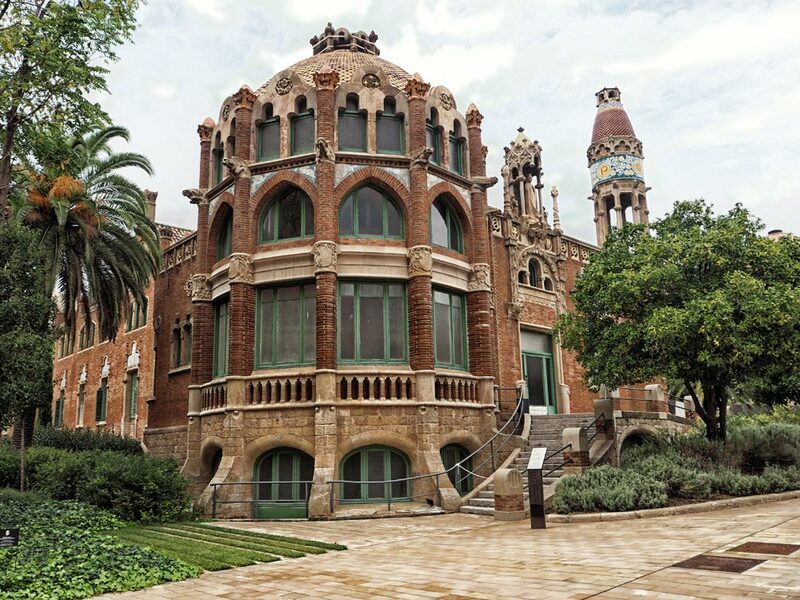 Back to the lovely monastery of Pedralbes in Barcelona, which is a delightful place to visit and includes an exhibition of the Monastery Treasures. 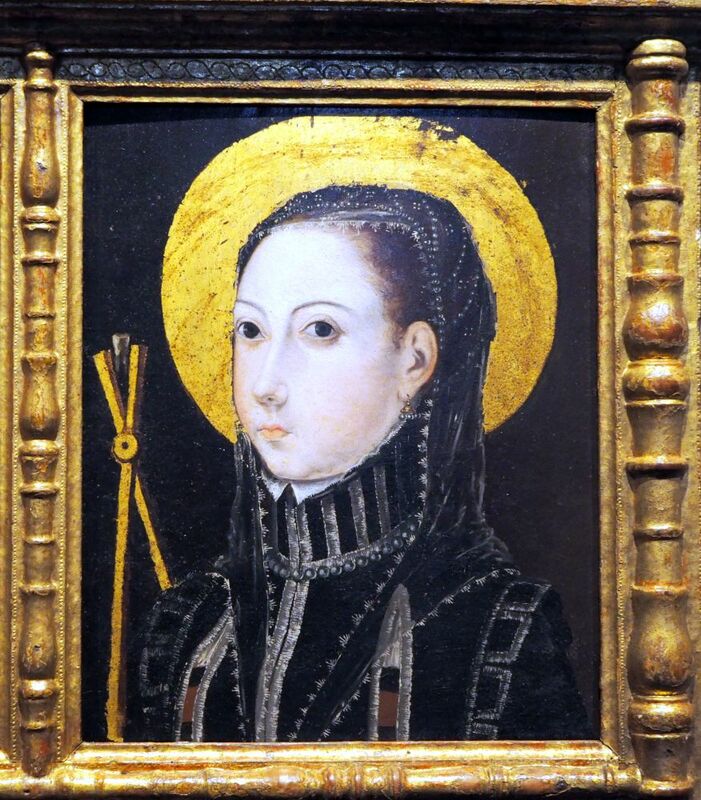 The founder of the monastery, Queen Elisenda of Montcada, created a convent of great spiritual and cultural importance. Her wealth, and that of the women who entered the convent, who had a high social background, brought valuable contributions to its assets. 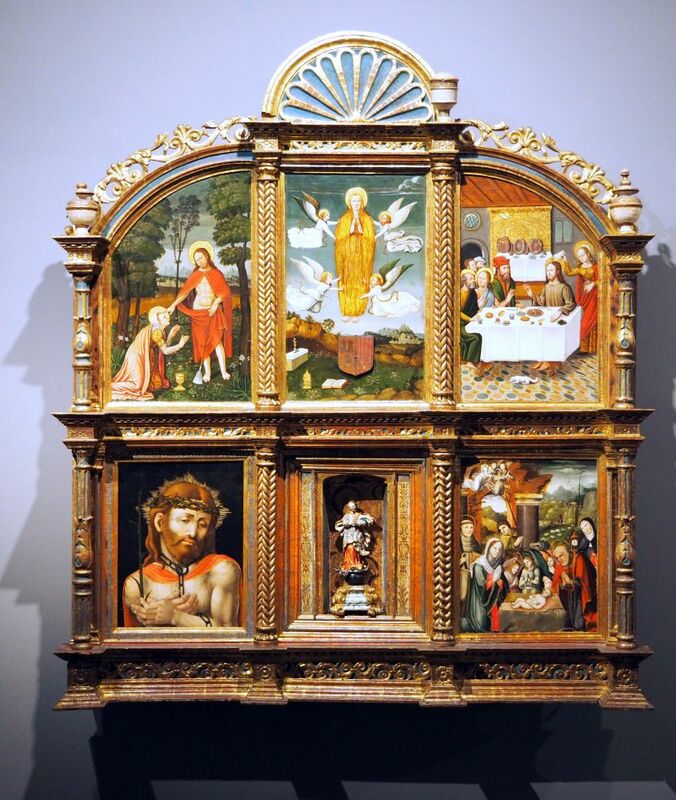 …presents a unique collection of works of art, furniture, and secular and liturgical objects from the monastery treasure, built up, conserved and restored over the centuries by the Poor Clare community. 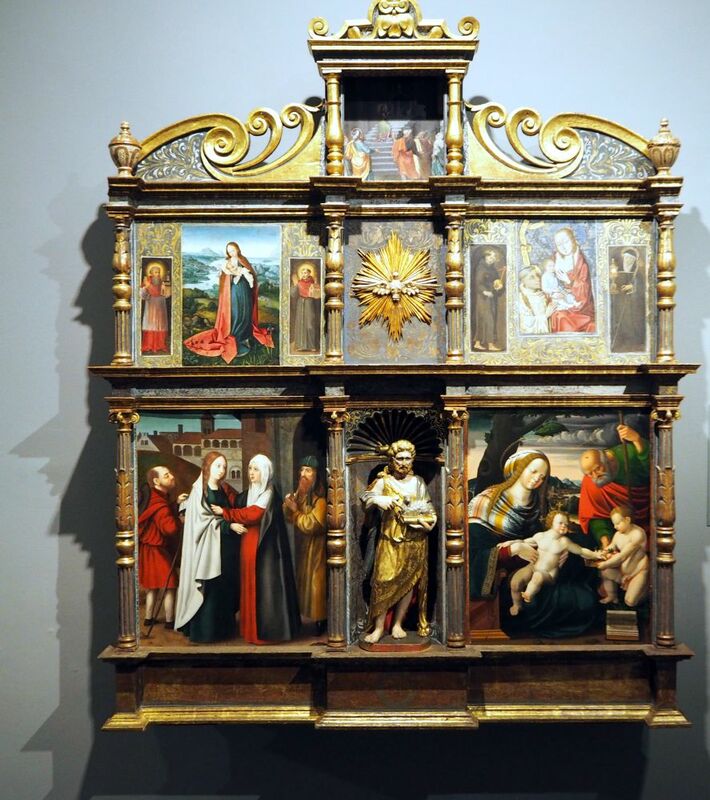 All of the paintings in this factitious altarpiece are the work of artists active in Catalonia during the first half of the 16th century. 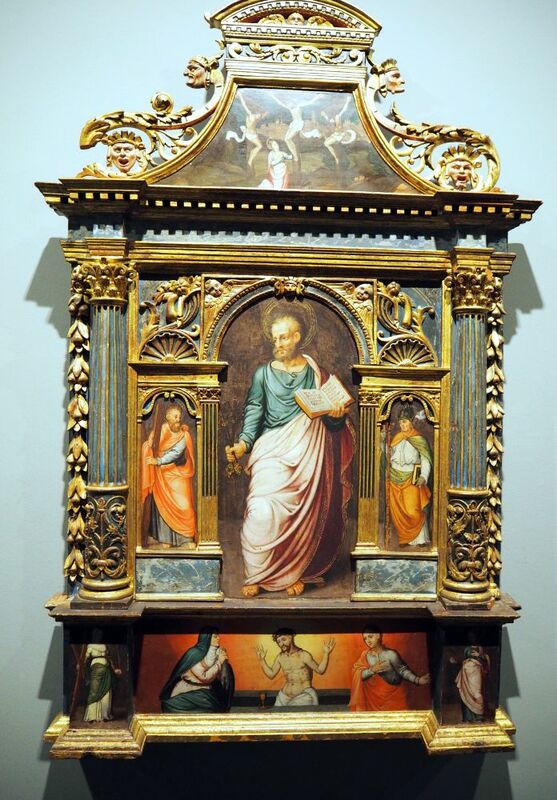 The upper elements of the piece below are panels of a triptych, in which the side panels were the doors. The most notable piece of this factitious set is the Virgin with the child in a landscape (bottom right), which may be attributed to Joachim Patinir and his workshop. Towards the end of the 15th century the monastery entered a period of reforms driven by Ferdinand II of Aragon. Life in the cloistered community became stricter. 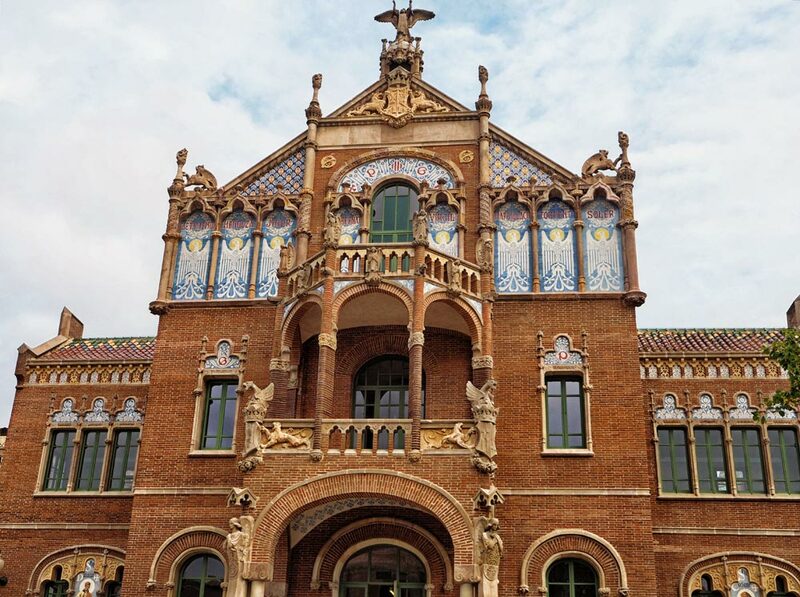 At the same time the importation of Flemish artwork into Catalonia took place as close trade relations were formed between the Spanish and northern Europe. 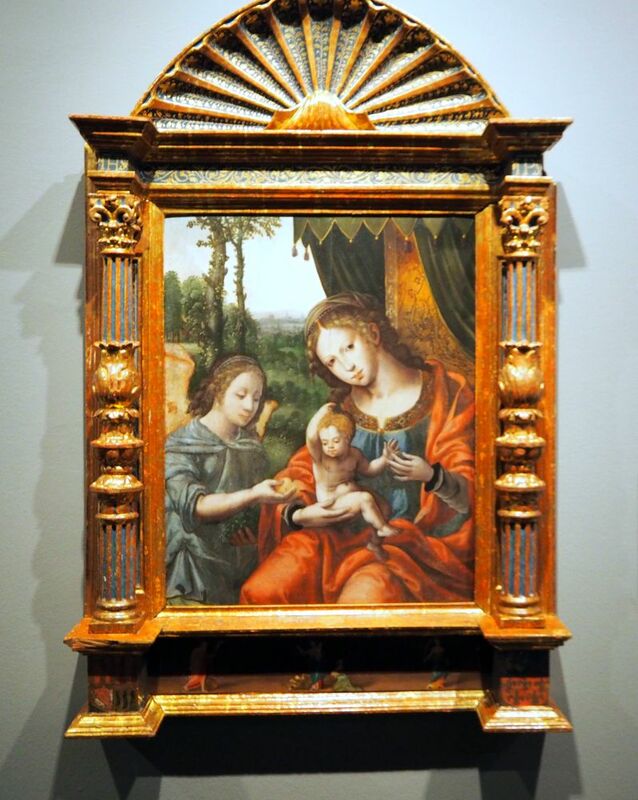 The most significant piece of this factitious work is the Announcement (top left) which may be attributed to an unknown Flemish artist known as the Master of the Legend of Saint Catherine. 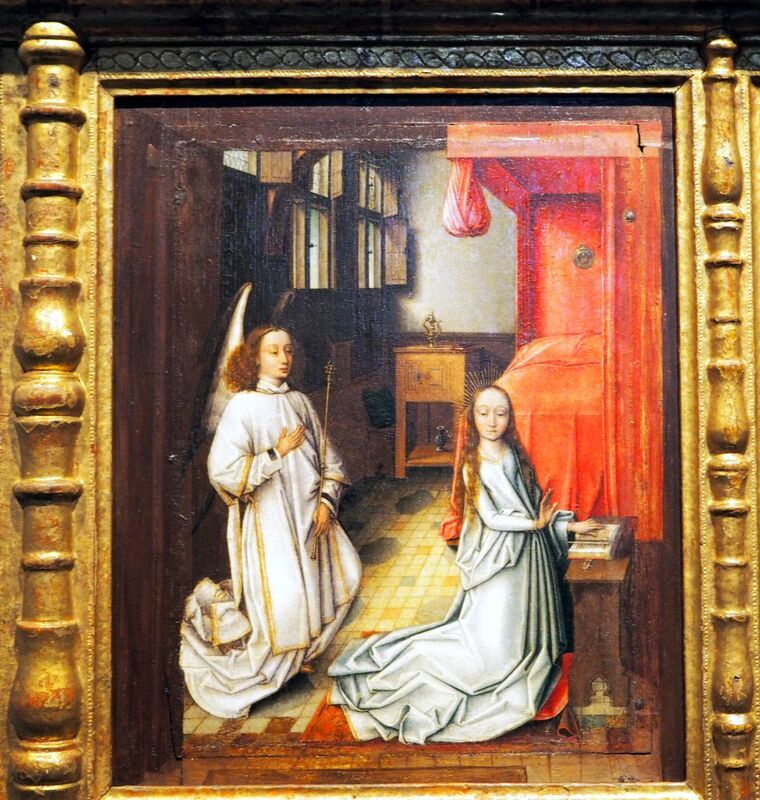 The domestic interiors are reminiscent of the Jan van Eyck models that Van der Weyden had reproduced. 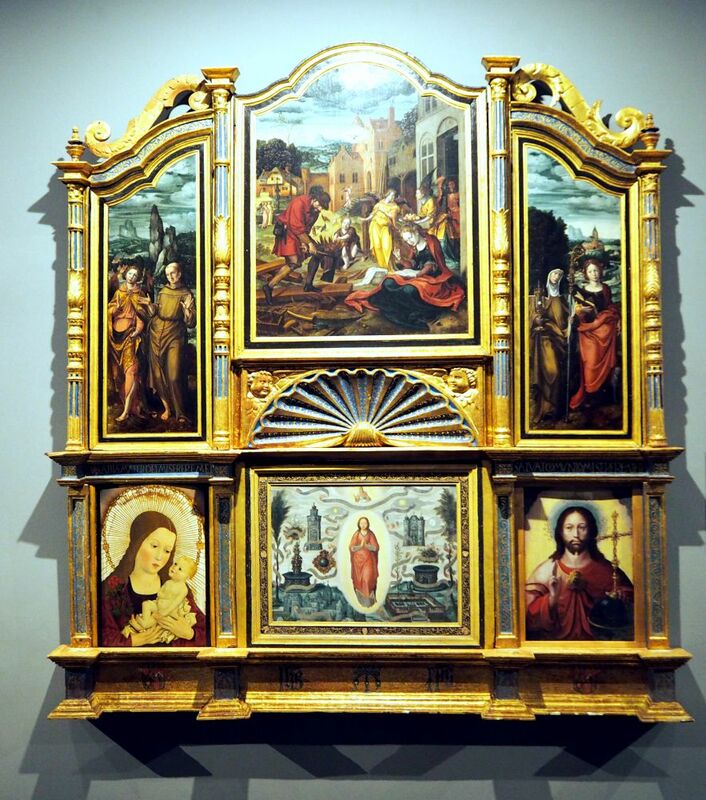 ‘Factitious’ altarpieces combine pictorial and occasionally, sculptural sections of different provenance and styles. So we find Spanish and Flemish works side by side. The tableaus have often been trimmed to size to fit into the new structure. They were generally made in the mid-sixteenth century and inspiration for their manufacture may have come from the classicist architecture at the time. Three of them preserve the heraldry of the nuns who paid for their production or owned them. Of a similar format to the factitious pieces of Pedralbes, this is a unitary collection. 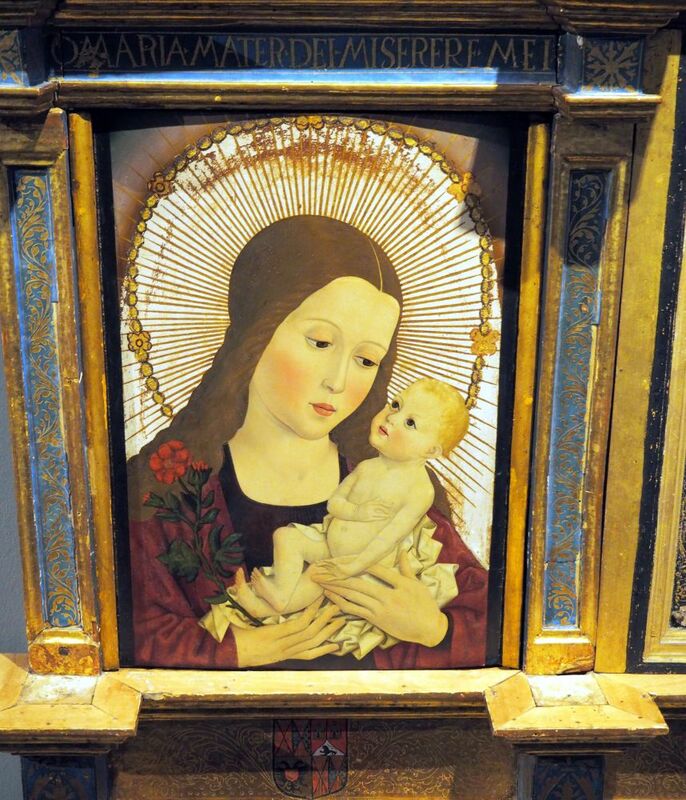 Its paintings may be attributed to the Catalan artist Joan Mates. The two central figures derive from a model by Jan Gossaert while the added angel and landscape is an idea from Pieter Coecke van Aelst. 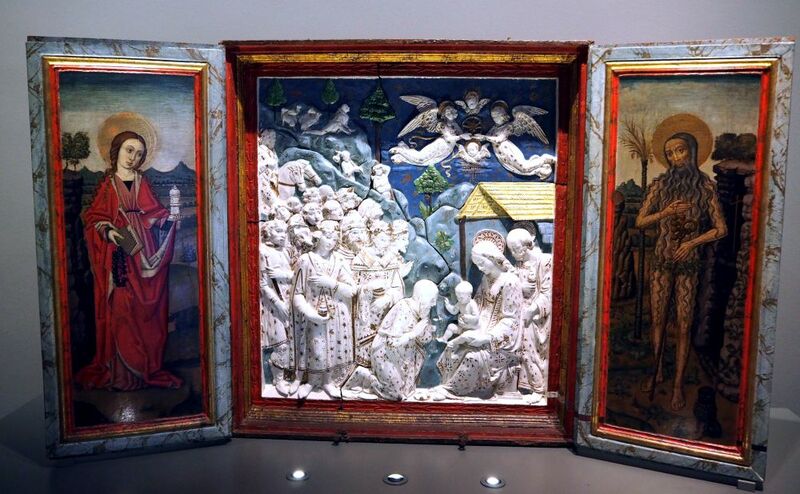 A factitious triptych with doors added to the central relief. 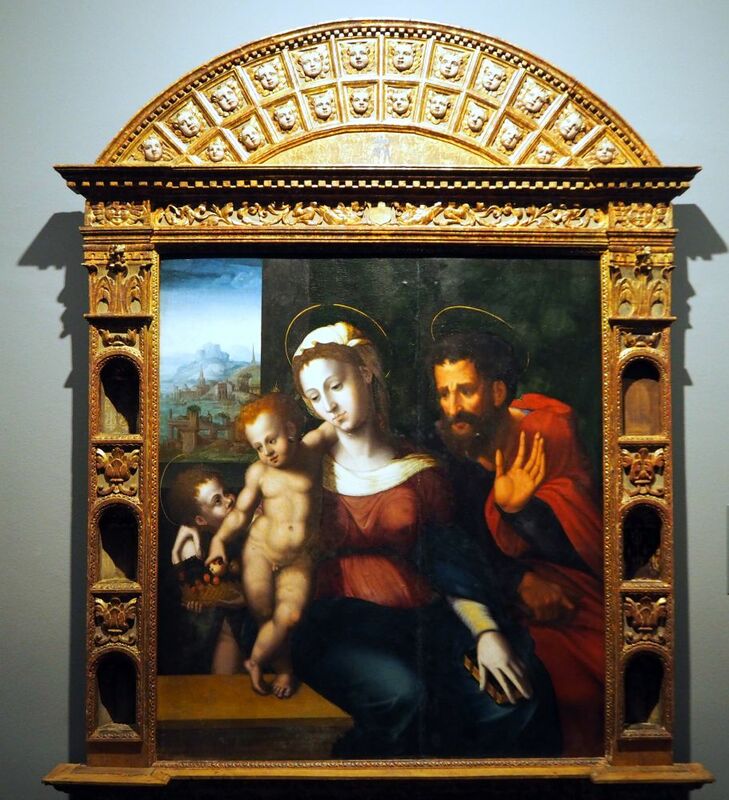 A work of art from the Italian Renaissance was exceptional. The relief which feature the Adoration of the Kings but with an Announcement to the shepherds in the background, is made from the characteristic glazed terracotta of the Florentine workshop of the Della Robbia family. 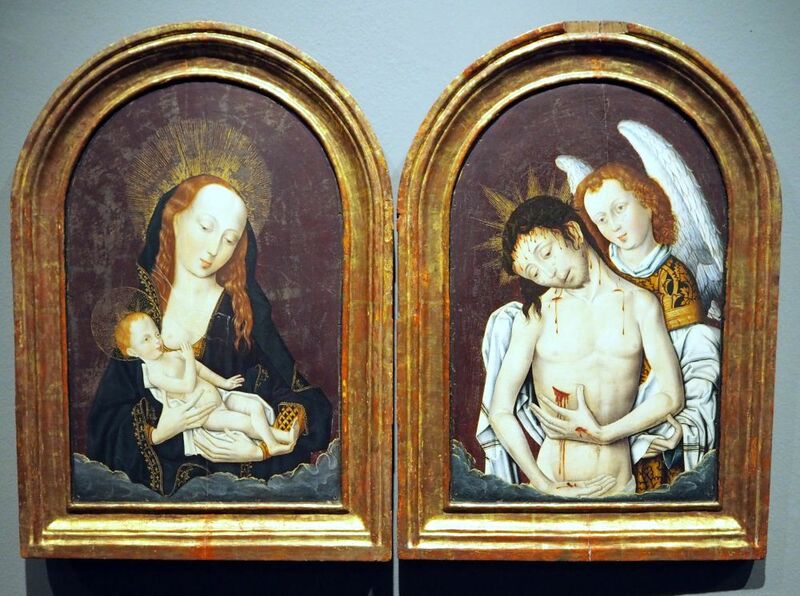 This diptych is one of the characteristic formats of “devotional painting” of the former Low Countries. The unknown painter probably had a workshop in which such paintings were almost mass-produced, exploiting models tracing back indirectly to the works of Rogier van der Weyden. The descriptive tendency and open window in the background point to a Nordic artist of discreet quality with knowledge of Italian Renaissance as regards typologies and body language. 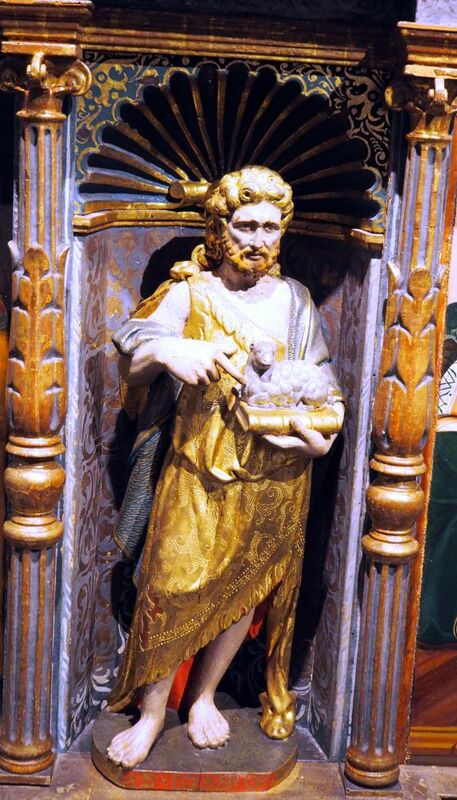 The sculptures in the niches of this altarpiece may have been lost in the Spanish Civil War. 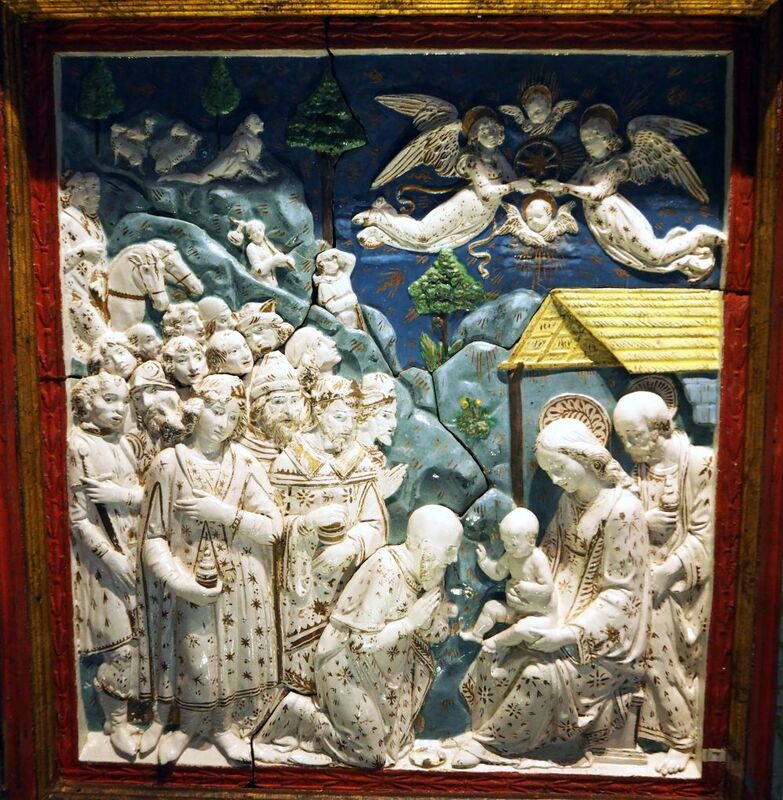 The relief of the Epiphany comes from the workshop of Damia Forment. The coat of arms links this to Sister Teresa de Cardona who was the first cousin of King Ferdinand II. By the beginning of the seventeenth century the community in Pedralbes had witnessed a gradual but relentless decline in their income. Subsidies from King Phillip II and aid from the Council of the One Hundred assisted them in building the infirmary and renewing their cloisters. The Catalan Revolt of 1640 worsened their position as did the 18th century War of the Spanish Succession. At the end of that century further royal donations came to their assistance and helped to renovate and improve the building and the liturgical ornamentations. 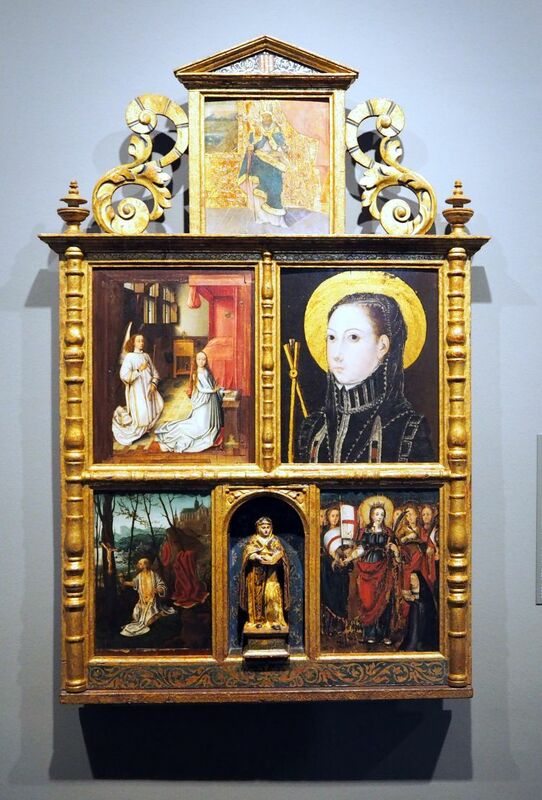 Despite the precarious financial situations the nuns would not renounce the maintenance and renewal of their liturgical adornments and some interesting works of art were purchased during this time. Please visit the website of the monastery to find more about this exhibition. Posted on May 7, 2017 May 18, 2017 Categories History, SpainTags art, barcelona, exhibition, monastery, photography19 Comments on The Monastery Treasures: Monastery of Pedralbes. The magnificent staircase that leads up from the impressive foyer is a perfect example of the relationship between architecture and decoration. The small cupola over the stairs is a stained glass skylight that fulfils one of the principles of Modernism: that of assigning a prominent role to light and colour. Something that Domènech i Montaner was master of. The ceiling is made up of nine vaults resting on stone and marble columns. 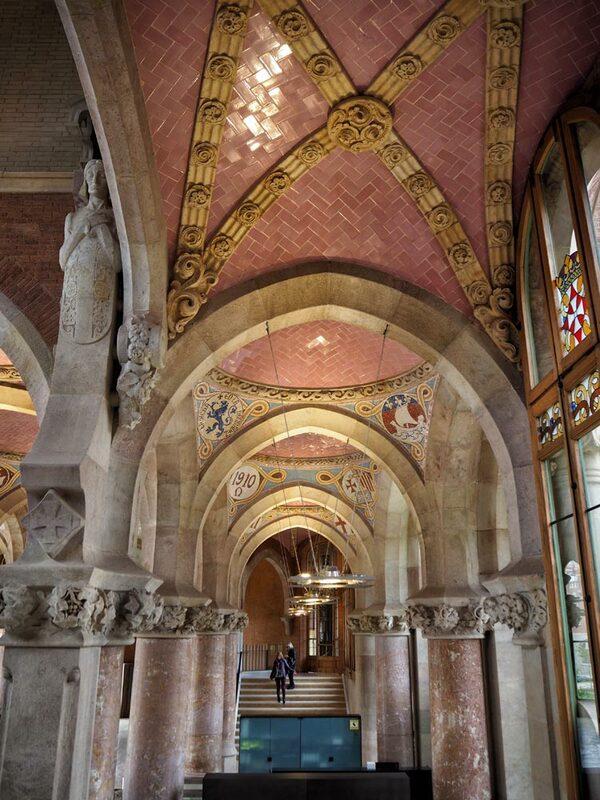 All the vaults are clad in pink-lilac rectangular tiles, arranged like sprigs. 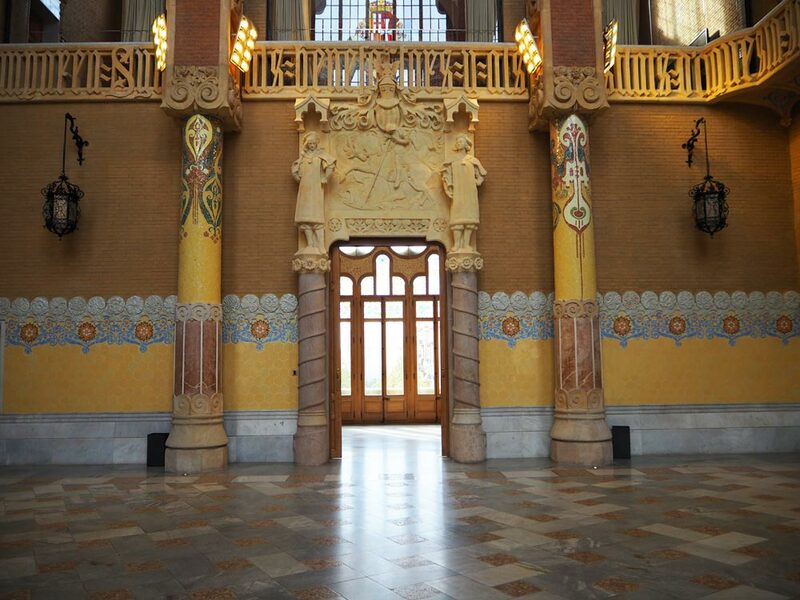 The central vault features emblems of Barcelona and Catalonia, the cross of Barcelona Cathedral and the cross of Saint Jordi. 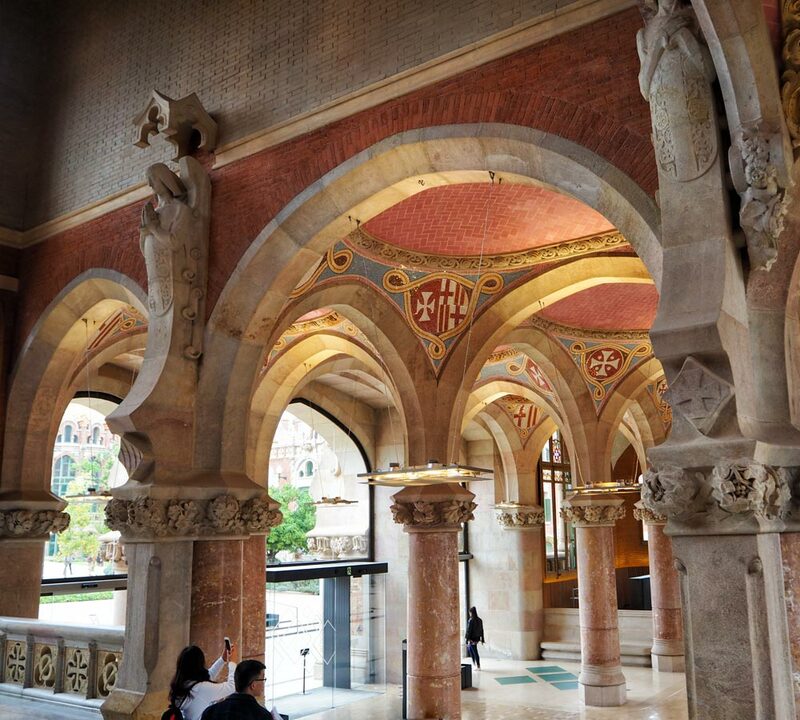 You can go up that magnificent staircase, where you will find a corridor of glass and stained-glass windows and a particularly dramatic hall where the ceramics and the stonework leave you with your mouth open. You could spend a lot of time simply admiring the craftsmanship in this hall. 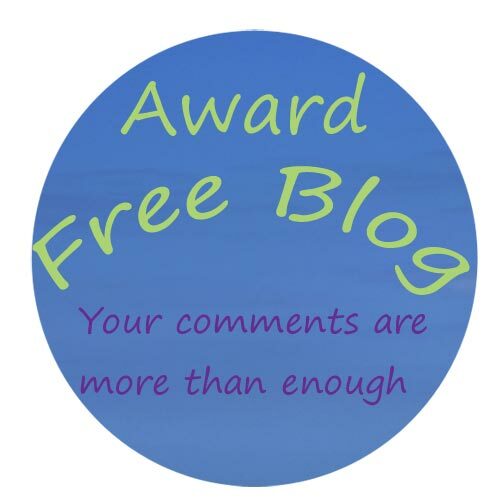 This is the last of my series on the Art Nouveau site. I do hope I haven’t bored you all, but it is a fascinating and very rare example of that style of architecture and it is admirable that the work carried out has been done to meet three fundamental criteria: recover the original constructions designed by Domènech i Montaner, transform the pavilions in to functional work spaces and apply sustainability and energy saving parameters. 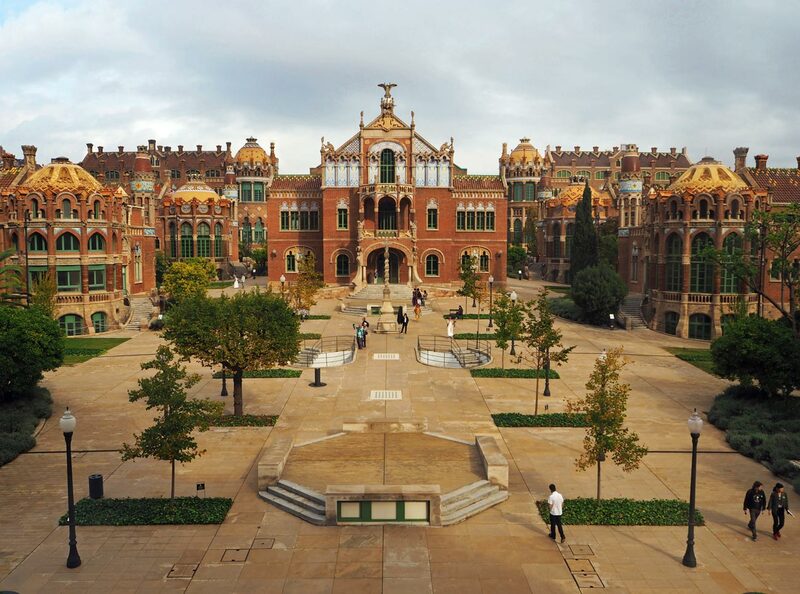 Source: All the information in these Sant Pau posts is taken from the admission booklet. 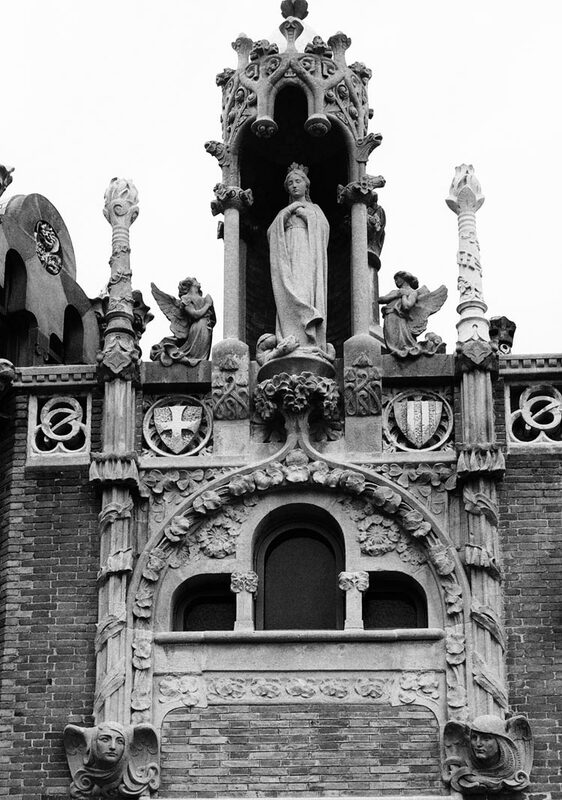 The front facade of the Surgery Pavilion (Casa d’Operacions) is incredibly elaborate with sculptures galore. The doorway features two angels by Paul Gargallo in that distinctive Art Nouveau style. 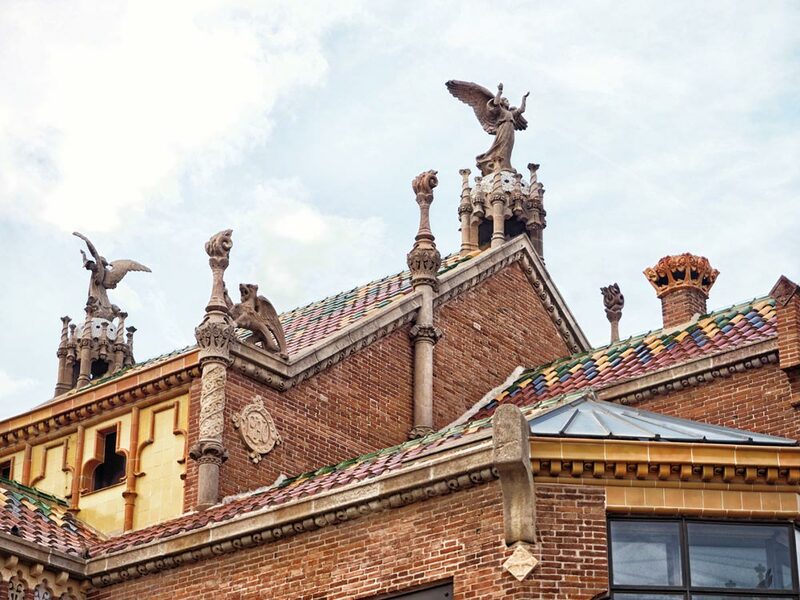 Two spectacular open-mouthed winged dragons protect the emblems on the first-floor balcony and support the two lions that represent the Hospital de la Santa Creu and the City of Barcelona. 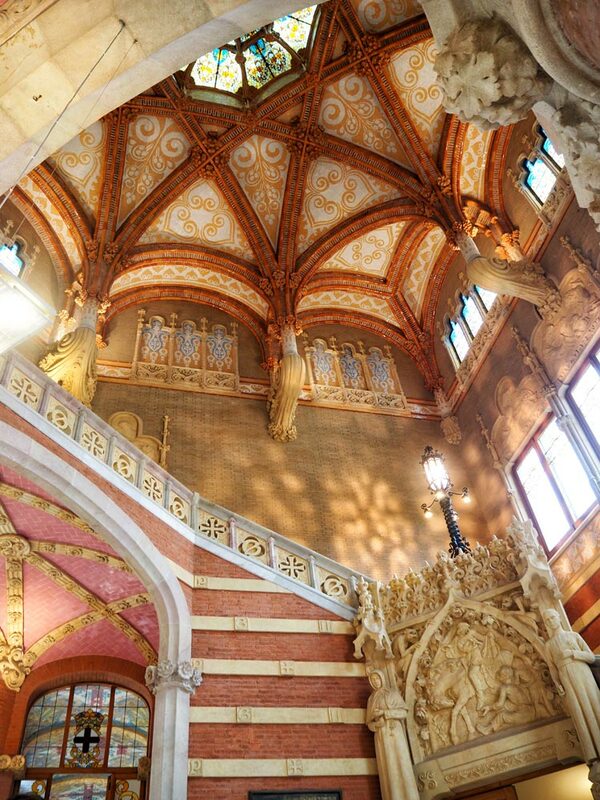 On the balcony above the entrance gallery there are several angels and the frontage is crowned by an angel with wings unfolded seemingly about to take flight. Two winged lions sit below. And on the corners are winged monsters which symbolise the forces of the unknown world, of negativity and of death. 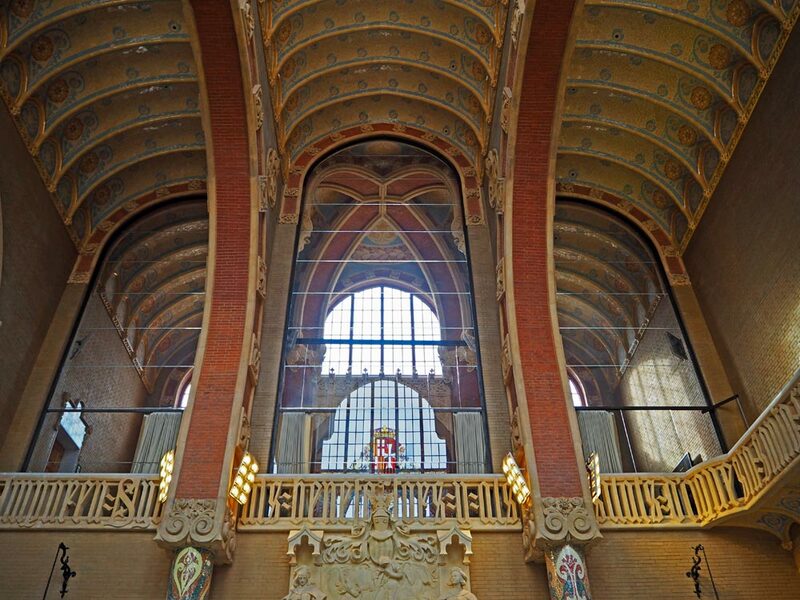 The roof from the rear with a similar angel appealing for divine grace perhaps? Casa D’Operacions in the centre of the site, and the railings show where the tunnels exit. Finally another view of the site from the Administration Pavilion with the Surgery Pavilion in the centre and the open layout of the gardens. In front you can just about make out a replica of the cross which formerly stood in the middle of the Gothic cloister at the Hospital de la Santa Creu (1401). 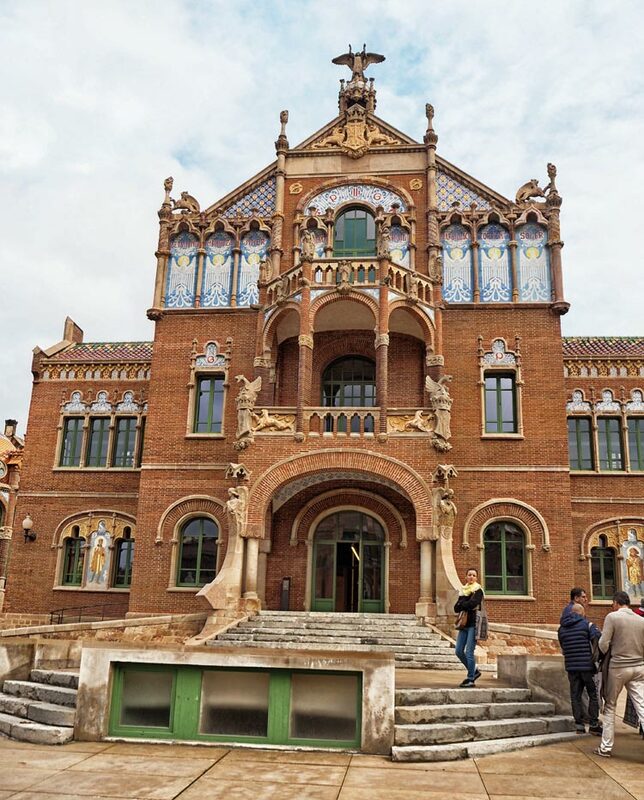 La Puríssima was built between 1905 and 1912 and was used for General Surgery and Neurology. I love the way each pavilion has its own private garden. Orange and lemon trees and lavender fill the beds around the sweeping steps.